Greetings and salutations, folks – I’ve had some time away from social media, which was both necessary and nourishing, and now I’m back just in time to announce the bookclub title for March. This month, we’re reading a brand new title by Nicole Hayes, the author of The Whole of My World and One True Thing, and proud footy tragic. Nicole has been one of the forces behind The Outer Sanctum, a podcast that spends time on the big questions of AFL (like, will Cyril Rioli ever come to Richmond? – unlikely *sads*). These rockin’ women were the team who broke the Caroline Wilson-Eddie McGuire story last year, and they’ve been integral to the long-time-coming new AFLW movement. With Alicia Sometimes, Nicole has co-edited From the Outer, a well-reviewed collection of stories from fans of the game whose voices are sometimes lost in the margins, and this year she and Alicia collaborated on A Footy Girl’s Guide to The Stars of 2017, a showcase of the key players in the first ever elite women’s AFL comp. 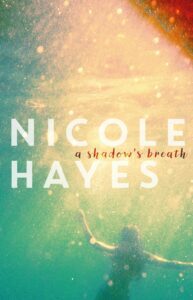 But in the flurry over her AFL/AFLW commentary, Nicole’s other talent – as an extraordinary writer of YA fiction – is sometimes overlooked. Last month her third title, A SHADOW’S BREATH was launched by Amie Kaufman (The Illuminae Chronicles) and Emma Race in Melbourne, and I’m predicting that this book could go on to do Good Things. A SHADOW’S BREATH is the story of Tessa, whose life is looking up now that her mum is back on the wagon. But things go painfully awry when Tessa and her boyfriend, Nick, are stranded in the wilderness after a horrifying car accident. The story is described as one of ‘heartbreak, courage and forgiveness’, and I hope you enjoy it! Remember, you can order A SHADOW’S BREATH through Boomerang Books this month and get free shipping by using the ‘loveoz’ promo code. Now, to another order of business: I would very much like to give someone else a go of choosing the bookclub title from time to time. To that end, I’d like to run a little competition. It’s extremely easy to enter: if you would like to be the person who selects our title for April, all you have to do is spread the word about #LoveOzYAbookclub, and let me know. Whether you post about this month’s title on Instagram, write about bookclub in a blog post, chuck up your fave OzYA reads and give us a nod on Facebook, dash off a quick Snapchat message, or blag the news around on Twitter, or Tumblr, or Google+, or GoodReads, or…anywhere you like, really – the format of the message is up to you. The only important thing is that you let me know about it in some way, so I can then put your name in the hat. If you use FB or Twitter or Insta, just tag me (Ellie Marney, or @elliemarney) in the message. If you use another format, take a quick pic and paste it up either here, in comments, or in the FB thread for this title selection post. The winner will be announced in two week’s time, and will win a) the chance to steer the course of bookclub by choosing our April title, and b) a $20 book voucher from Readings. So good luck!